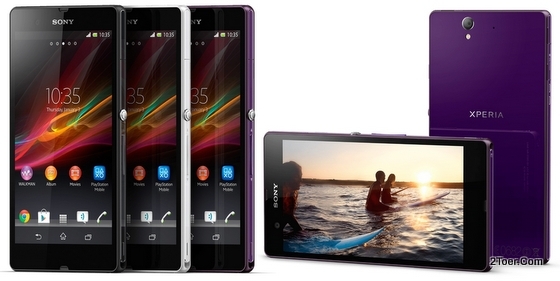 First of all, before you learn step by step on how to insert SIM card or install Memory card to its slot and also how to remove it, you must know the locations of each slot on the body of Sony Xperia Z (both C6602 or C6603). The picture that we gave you below would help you to find the slots for both of them. The micro SIM card slot (with its SIM card tray) available on the left-side of the phone's body (from rear panel view: number 18). And for the microSD card slot, it locates on the left-side of the phone body from the front panel view (aka right side from rear panel view: number 7). 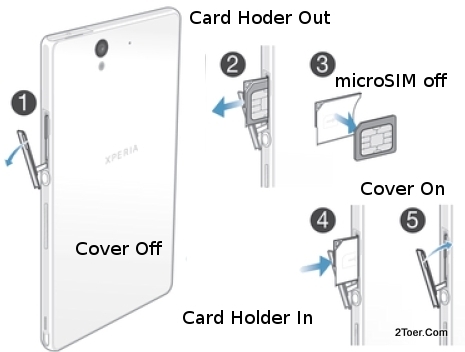 The micro sim card tray (holder) slot of Xperia Z is covered by a casing protector. This casing is the key that make the phone water resistant. 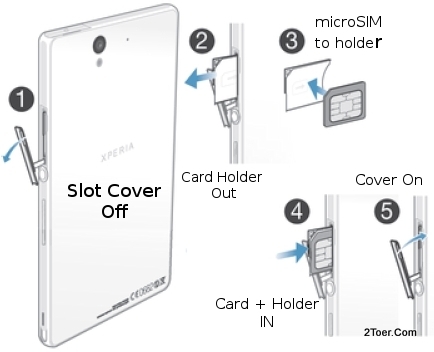 Opening and closing the sim card holder slot cover should be done properly. There is a gap on the cover of micro SIM card slot. Insert your fingernail into the gap, gently lift the cover out until it's detached. Now you can see the microSIM card holder inside its slot. With your fingernail you can pull out the card holder until it fully removed from its slot. Now you can clearly see the empty slot and the card-holder that had been removed. 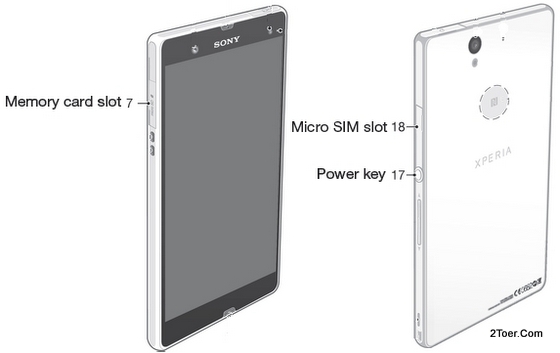 The next step is how you can install the microSIM to its slot. Place with the proper position the micro SIM into the card holder (cut-edge properly align with card holder), make sure the gold-colored contact facing downward (pictured), the you are ready to inserting back the card holder with microSIM into the slot. Just push the holder tray until the holder reach the end of the slot. Finally re-attach the cover of the slot. Make sure it properly attach with the body. To remove the microSIM card from its card holder and the slot, you just need to do the same steps: Open the cover > Pull out the holder > remove the microSIM > insert back the holder to its slot > close back the cover > Done. As usual, almost Android phone has similar way on how you can perform Factory data reset aka Hard reset, so do in Sony Xperia Z C6603 or C6603. Here the steps from inside the phone on doing the Factory Reset: Go to Settings > Backup and reset > Reset phone > Erase everything. Remember that if you just need to resolve a simple problem such as your phone hang, or stop responding (not to often), you just need to press and hold both volume up and the power button for about 6-10 seconds to force the phone to restart aka reboot (whenever the phone vibrates, release all the keys).